Been thinking of starting a food blog, but not quite sure where to begin? We'd be happy to help you with that! You're probably wondering why this is the first step... Isn't food my niche? The answer to that question is no, not really. Food is a very broad term and can encompass a number of different topics. Are you a restaurant reviewer? Recipe Developer? Nutritionist? Fine Dining Enthusiast? Burger Aficionado? Are you focusing on a particular country, or city? Finding your niche and sticking to it is key to your blog's success. Developing a niche is the first step to finding and attracting your target audience. For example, single blokes in their 20s looking for a dirty big cheeseburger won't necessarily be interested in reading about 10 minute breakfast recipes for the mom on the go. Our blog focuses primarily on featuring quality restaurants and travel destinations throughout Australia. Deciding on a niche can be stressful, and you'll be tempted to do it all. But trust us, it's easier to focus on one or two things and do them extremely well...then to blog about everything and have poor quality content. Choose something that you're passionate about and that relates to your everyday life. This is perhaps one of the most important steps. Why is that? Because a poorly chosen blog name can result in a lot of regret later on. After you have established your following and relationship with brands it's not advised to change your name. This is what people know you for. Changing your name suddenly can result in a lot of confusion and rebranding is no simple task. Choose something unique, and catchy. Don't select an unoriginal name like "BestFoodEverInBrisbane.Com" There are a million bloggers with similar names, and you're going to want to stand out from the pack. This name is also very limiting. Do you plan on living in Brisbane for the rest of your life? If not at some point you will need to change your name. Don't be afraid to get creative or even a little weird. Some of the best food blogs out there have quirky, interesting names. For instance, our favorite insta-foodie's blog goes by the name of Tara Milk Tea. In an interview, Tara said her blog name was an old nickname her friends made up for her because she drunk a lot of milk tea. It's unique, it's catchy, it works. Our name (AmeriAus) is a conjunction of the nationalities of my partner and I. I'm American and he is Australian. This blog focuses on our personal travel and food experiences. The name provides us with a lot of flexibility. For instance if we moved to a different city, or decided to live in the States for a while our name is still relevant. Choose something that represents you and own it! 1. Note Pad: We go through notepads like pairs of socks. It's a great place to jot down your blog post ideas, social media to do lists, goals and blogging tips you pick up along the way. It's also handy to have on you at media events in case any interesting information is mentioned that you might want to include in a future blog post. 2. Camera: If you are serious about your blogging then having a quality camera is essential. Content is everything when it comes to blogging and if businesses think your content is poor they won't want to work with you. 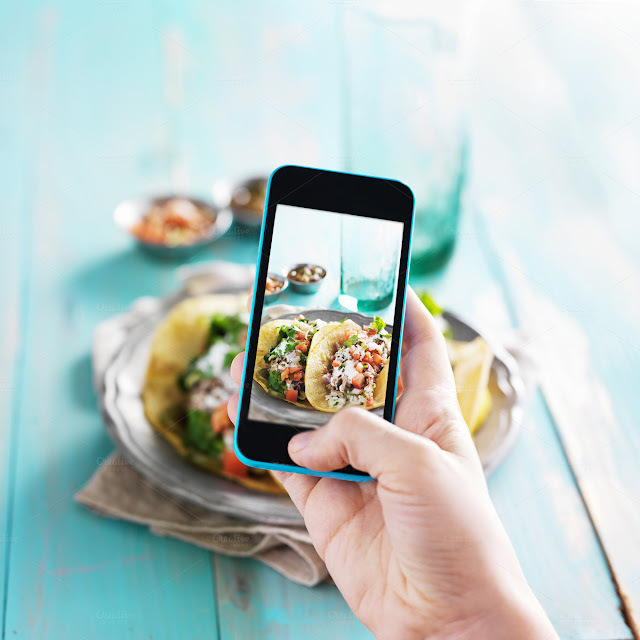 I mean what restaurant owner wants blurry, barely recognizable photos of their food? You don't have to spend a fortune to take great pictures. Their are plenty of affordable compact cameras that will do the job just fine. 3. Planner/Calendars: A calendar or planner is a must have. For us, it's where we keep track of events, restaurant openings, and important holiday's we want to highlight on our blog. Once your blog starts to get noticed by pr/marketing firms you'll start to getting invites to different media functions. This will be your first introduction into the world of professional blogging and you're going to want to make a good impression. Keep track of all your commitments in a planner instead of relying on your memory alone. Always make sure you're on time and avoid canceling last minute unless its a real emergency. Running a succesful food blog is a lot of hard work!! We are constantly learning and working on ways to improve. Do you have any useful tips and advice for new food bloggers??? Let us know!